Have you ever wanted to make a Winter wreath using tree branches from your yard, but didn’t know where to start? I am going to show you how to make a beautiful live wreath. I will admit that this is my first attempt at making a live wreath, so it’s not perfect by any means. I learned how to make this wreath in a floral design class I am taking. The process is very time consuming and the larger the wreath, the longer it takes – and the process is very messy…I’ll show you why. In the class I am taking we had a choice of which greens to use to build our wreath, boxwood, pine, spruce or a combination. I wanted to make a boxwood wreath so I chose to use all boxwood branches. To make our wreaths, each of us were allotted 8 pounds of greens, that’s a lot of greens! I think I used between 5 and 6 pounds to make my wreath. Considering I would cut the stems off many of the branches, in the end the wreath is holding probably less that 4 pounds of stems. Begin with your mold, concave side up. In order to preserve the stems and make our wreath last as long as possible, we used Sphagnum milled moss. The branches will be inserted into the moss, where they will receive nutrients hence prolonging the life of the wreath. Start by soaking the moss in a tub of water until it is very wet. This doesn’t take long, just a few minutes. Pull out handfuls of the wet moss and arrange it around the wreath form. Do not wring the moss to eliminate the water, just have the water drip off the moss as you pull it out of the bucket. It is a messy job, so do this on a table or area where you won’t mind water spilling on the ground. Once you have the moss evenly distributed around the mold, start wrapping the moss and the mold with plastic wrap. Continue wrapping all the way around the mold. Don’t use a lot of pressure or wrap the mold too tightly, wrap to make snug. This process doesn’t take long but is a bit messy. Secure the end of the wrap using a couple greening pins. Next, we start inserting our branches into the mold. Before we insert a branch into the mold, we need to create a hole in the wrap. Using a pointed floral pick, make a hole in the plastic wrap. Begin inserting a branch into the hole of the mold. The pick does not stay in the mold, it is only used to make the hole. You want to make sure that the ends of the branches you insert into the wreath are free of leaves. Use a de-thorner to remove the leaves on the ends of the stems. This is a time consuming process and requires some patience. I wanted a very full wreath so I used large branches. If you want a smaller looking wreath with shorter branches, cut off the stems of the branches and insert those into the mold. Continue inserting branches all the way around the wreath. Make sure to fill in areas you may have missed with shorter branches. In the end, my wreath turned out pretty well for a first attempt. To preserve the wreath, it should be placed in a tub of water once a week to rehydrate the moss. Or you could place it on the ground during a good rain storm to restore it and hydrate the branches but I suggest removing the bow first. 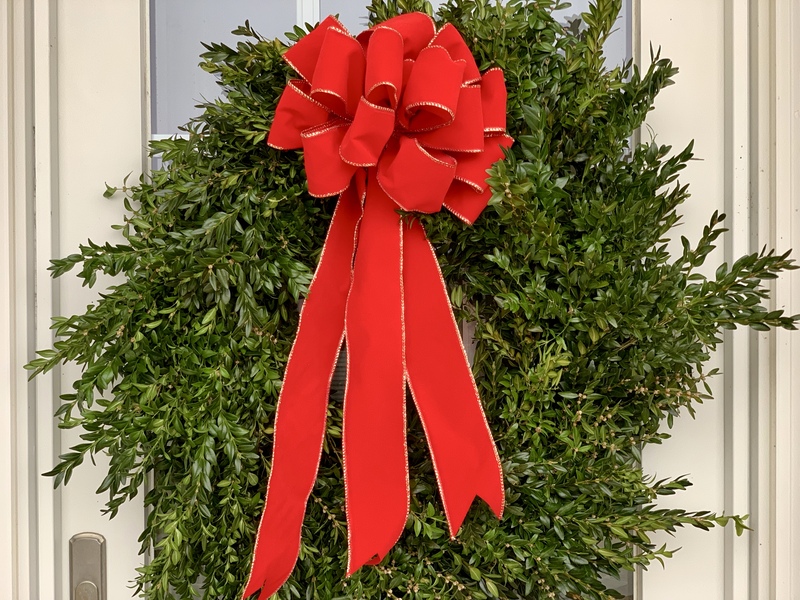 My boxwood wreath is placed on our mudroom door along with 2 Christmas planters. You can read more about Decorating the Front Porch for Winter. The area feels so festive now and looks pretty. Making the wreath was fun and I learned a lot from the process like which moss to use. It is very important to use long fiber moss when you make your wreath…you can’t use just any type of moss…it has to be sphagnum long haired moss. Other ideas for your wreath can include inserting juniper branches with berries or holly branches with red berries. There are so many different types of wreaths you can make. Start by selecting branches from your yard and create your own design. Let me know how it turns out! If you make a wreath using my step by step tutorial, tag me on Instagram HERE. More Christmas inspiration coming your way, subscribe to Happy Haute Home and don’t miss a post! Follow along on Pinterest HERE, and Twitter HERE and feel free to pin and tweet your favorite pics from Happy Haute Home. It’s beautiful, Denise, love the big red bow! Looks perfect on your window! Thanks! It was a great experience learning how to make it. You are so crafty, I bet you know all the tricks florists use in creating beautiful arrangements.